Is your nonprofit effectively maximizing social media? If not, you are missing out on the most effective way to amplify your nonprofit’s mission and build an audience of evangelists for your purpose. Social media isn’t going anywhere. In fact, it’s only developing at a faster rate than ever, and smart nonprofits are keeping up. 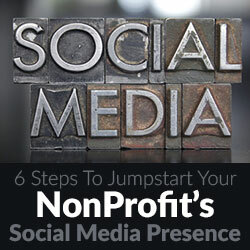 Whether you are a beginner or a social media veteran, here are six steps to jumpstart your nonprofit’s social media presence. The beauty of social media is that it gives anyone the opportunity to start a conversation with anyone, anywhere. However, this beauty can become ugly when the conversation becomes noisy and crowded. The first step to nonprofits rising above the noise by effectively using social media is deciding their voice. This process starts offline with the leadership team establishing the organization’s mission, vision, and values. From there, your team can decide your nonprofit’s voice as you decide which conversations you would like to champion. Decide which conversations your nonprofit would like to engage and be clear with a consistent voice when you engage those conversations. Engaging in the conversation isn’t enough – you need to lead it. Become the thought leader in your nonprofit’s market by using your voice through social media to help you establish your platform. The more specific you can be about your voice within the conversation, the greater success you will have in rising above the noise. I’ve heard some people recommend to only choose one or two social media platforms and be consistent with those. I disagree. In 2015, when social media, texting, and emailing are the most common ways of communication, every nonprofit should have a presence on the most common social media platforms. As of today, those platforms are Facebook, Twitter, LinkedIn, Google+, and Instagram. I want to take a moment to specifically speak to Google+. While most people do not use Google+ to correspond with others on a daily basis, you must make posting via Google+ a priority. It is a key factor in establishing your organization’s presence in search engine results, increasing your visibility in prime online real estate. When establishing your presence on social media, register with branded usernames to maintain brand consistency among your channels. Social media is changing daily, and these platforms will not be the most common forever. This is why you need someone on your team who is responsible for managing your nonprofit’s online community and keeping up with new trends. Simply signing up for these social media platforms and posting every once in a while doesn’t cut it. The key to success on social media is consistency. In our work helping faith-based nonprofits find their key staff, one of the most common searches we are conducting right now are marketing and communications staff members. Smart nonprofits are hiring a digital native with a marketing mind who is responsible for building community through social media. This team member is focused on growing the nonprofit’s presence and curating its conversation online. As a leader, equip your social media manager with the tools he or she needs to succeed. There are many tools on the market like HubSpot, HootSuite, and Buffer that can help your social media manager maximize his or her efforts. Sharing your own content isn’t enough to build a substantial following on social media. Find other organizations that align with yours that are creating content and begin sharing it. As you share aligning organizations’ content, they will likely begin sharing yours as well. This will help build your audience through other networks that align with yours. Once you have chosen the conversation you want to engage, setup your accounts, and have a person who is responsible for building your platforms, start building community online. The primary way to start building community online is to engage in conversation that builds community among your nonprofit’s target audience. Once you have the basics of your social media platform established, begin experimenting with social media advertising. My recommendation is to begin with Facebook and Twitter. Use the Power Editor on Facebook to create several ads at once to reach specific audiences. Use Twitter cards and promote sponsored tweets to a tailored audience with interests that align with your organization. Start small when you begin advertising with social media. Success will look different for every nonprofit, so take time to analyze your results and tweak them as necessary. William Vanderbloemen is the author of Next: Pastoral Succession That Works and President/CEO of Vanderbloemen Search Group, a for-profit startup that leads in in executive search for churches, ministries, and faith-based organizations.